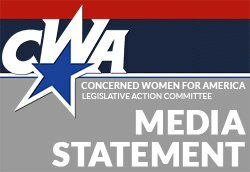 WASHINGTON, D.C. — Concerned Women for America Legislative Action Committee applauds Congress for final passage of the United States-Israel Strategic Partnership Act (S.2673). Senator Blunt (R-Missouri), one of the sponsors of S. 2673, states that the bill, “Authorizes an increase of $200 million in the value of U.S. weapons held in Israel, to a total of $1.8 billion. This stockpile is intended for use by U.S. forces in the event of a crisis, but it can also be used by Israel in the event of an emergency with Israel reimbursing the U.S. for any weapons used.” S. 2673 also seeks to broaden cooperation efforts regarding research and development, business, agriculture, water management, and academics. “CWALAC strongly supports Israel and efforts to strengthen the U.S.-Israeli relationship. Yesterday, the House of Representatives approved S. 2673, which the Senate unanimously passed in September, naming Israel a ‘major strategic partner’ of the United States. “In doing this, Congress reaffirms the United States’ commitment to its long-standing relationship with Israel, including but not limited to defense, security assistance, diplomatic relations, energy development, and encourages increase cooperation in academics and business.